Is General Electric Company a Buy? Despite its difficulties and poor performance in 2018, the industrial giant's stock is looking like a good value. A good question, and one that deserves close inspection before investors part with money on a stock that has fallen so much this year. General Electric Company (NYSE:GE) stock decline has been brutal, but nearly every stock has a price at which it's worth buying. The company's recent results were horrible, and credibility has been damaged with investors due to previous management's inaccurate guidance, but that doesn't mean GE's stock isn't worth buying now. 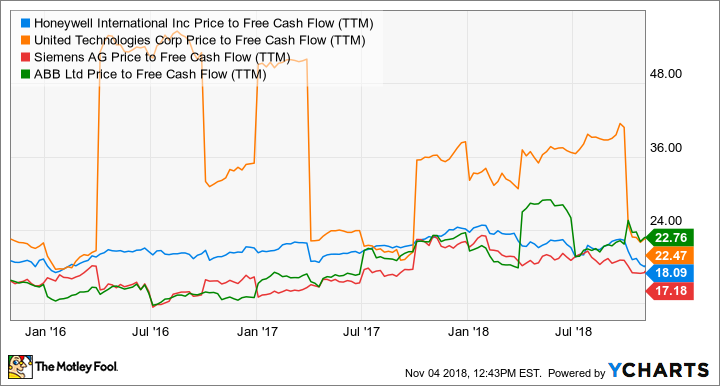 The key point to focus on is GE's free cash flow (FCF) -- usually defined as what's left over from a company's operating cash flow after capital expenditures are taken out. The problem with GE is that its FCF generation has been declining, and the market spent much of 2018 disbelieving management's forecasts -- more on this point shortly. Is it time to pull the buy trigger on GE stock? Image source: Getty Images. A look across some of GE's peers, such as Honeywell International and United Technologies, suggests a price-to-FCF multiple of around 20 times is a good proxy for GE's valuation. Management started the year forecasting FCF of $6 billion to $7 billion and indicating that 2018 would mark a trough in earnings and FCF generation with a pickup coming in 2019. Taking the midpoint of the FCF target range and multiplying by 20 gives you a market cap of $130 billion, or a stock price of around $15. So far, so good. Unfortunately, as 2018 played out it became increasingly clear that GE wasn't going to meet its earnings/cash flow targets in 2018, and the company recently slashed its outlook for the full-year with management acknowledging that earnings and FCF would fall significantly short of its targets -- the key culprit being GE Power. But here's the thing. The stock price has also fallen dramatically in 2018, and it's now starting to look interesting on a risk/reward basis. The current market cap stands at nearly $81 billion, so based on the 20-times-FCF principle discussed above, FCF of just $4 billion would be a good figure for new CEO Larry Culp to announce as a target for 2019, provided the market believes in an uptick in earnings and FCF growth in 2020. That target looks achievable. For example, recall that GE generated $5.6 billion in FCF in 2017, from $12.2 billion in industrial segment profit, and that on a rolling 12-month basis FCF is around $6.5 billion (excluding deal taxes and pension funding and including a dividend from Baker Hughes, a GE Company) from industrial segment profit of $10.9 billion. Conditions are likely to improve next year as ongoing restructuring at power should bear fruit. Meanwhile, companywide structural cost savings should kick in, corporate costs are being cut, and to former CEO John Flannery's credit, he did make some improvements in cash flow collection. Furthermore, unit production costs should come down on big-ticket items like the HA turbine (GE power) and LEAP aircraft engine. Culp has cut the dividend to practically nothing (this will give him another $4 billion in cash to use), and the pension has already been pre-funded for three years (from 2018-2020). In other words, provided GE Capital doesn't throw up something nasty, Culp has cash with which to restructure the business in the next few years. The aviation and healthcare segments (which together contributed nearly 90% of industrial segment profit in the first three quarters) are set to grow profit by 15% and the mid-single digits, respectively, in 2018. If a similar performance plays out in healthcare and aviation in 2019, then given even a flat performance at GE power, it's not hard to see industrial segment profit rising in the high single digits overall for GE in 2019 -- analysts have GE's EPS rising 16% to $0.88 in 2019 from $0.76 in 2018. Much of what the bears warned about in 2018 has come true, but to remain bearish now is to believe that GE's FCF will be weak or even decline in the future. Of course, this could occur if GE Power has some sort of long-term structural problem in its gas turbine markets due to the declining cost of producing and storing energy from renewable sources. In addition, the company has disclosed a litany of problems, including multibillion-dollar charges relating to insurance portfolios at GE Capital. The SEC investigations into its accounting are ongoing, and rising interest rates are likely to put pressure on any heavily indebted company such as GE. These issues are obviously a cause for concern, but most of them involve future projections and assumptions of worst-case scenarios. GE is certainly not a stock that deserves to trade at a premium, but does it deserve to trade at such a discount to its peers because investors must price in every worst-case assumption? Image source: General Electric Company. Is GE stock a buy? With a current market cap of nearly $81 billion, all GE has to do is give a credible plan to get to between $4 billion and $5 billion in FCF in 2019, with 2018 marking a trough, and the stock will be a good value. There's no guarantee Culp will do that, but given the ongoing strength in aviation and healthcare and the possibility that management is has thrown everything but the kitchen sink out at 2018 GE power results, it looks more than possible. All told if forced to choose between buying and selling GE stock right now, buying looks like the better option. The bar has been set low by recent events, and Culp isn't a man to bet against. It's been a long time coming, and GE is far from perfect, but on a risk/reward basis GE's stock is finally a buy.